In this Photoshop Text Effects tutorial, we're going to learn how to create a "fragmented tiles" effect using Photoshop's Tiles filter. Create a new Photoshop document. I'm using the 640x480 preset size. The Photoshop document is now filled with black. Click on the Foreground color swatch to change its color. 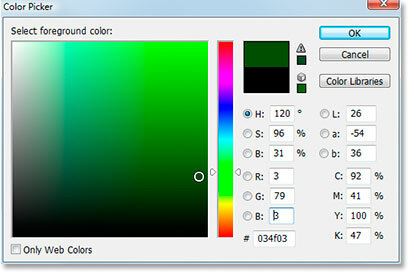 Use Photoshop's Color Picker to select a dark shade of the color you want to use for the text. Once you've chosen your color, click OK to exit out of the Color Picker. Select the Type tool from the Tools palette or press "T" on your keyboard. Click inside the document and enter your type. Use the Move tool to center your text in the document, and resize the text if needed by using the keyboard shortcut Ctrl+T (Win) / Command+T (Mac) to bring up Photoshop's Free Transform handles around your text, then hold down Shift+Alt (Win) / Shift+Option (Mac) and drag any of the corner points. Holding Shift constrains the text proportions, and holding Alt/Option causes the text to resize from the center. Press Enter (Win) / Return (Mac) when you're done to accept the transformation. After rasterizing the type, the text layer is now a normal layer in the Layers palette. Press "Ctrl+J" (Win) / "Command+J" (Mac) to duplicate the text layer. Hide the original text layer by clicking on its "Layer Visibility" (eyeball) icon. You won't see any change in the document since the copy of the text layer is blocking the original text layer from view, but if you look back in the Layers palette, you'll see that the eyeball icon has disappeared, indicating that the layer is now hidden. Photoshop Tutorials: Go to Filter > Stylize > Tiles to bring up the Tiles filter dialog box. The text after applying the Tiles filter. Select the Magic Wand tool from the Tools palette, or press "W" on your keyboard. Click on any white area with the Magic Wand to select all white areas inside the text. The text after deleting the white areas. Duplicate the original text layer and drag it to the top of the Layers palette. Click the layer's visibility icon to reveal the layer in the document. Click on the Foreground color swatch once again and choose a slightly lighter shade of your text color in the Color Picker. Press "Shift+Alt+Backspace" (Win) / "Shift+Option+Delete" (Mac) to apply the new color to the text. Rotate the canvas 90° clockwise. Photoshop Tutorials: The text after applying the Tiles filter twice. The text after deleting the white areas once again. Duplicate the original text layer again and drag it to the top of the Layers palette. Click once again on the Foreground color swatch and choose a lighter shade of your text color. Press "Shift+Alt+Backspace" (Win) / "Shift+Option+Delete" (Mac) to again apply the new shade of green to the text. Rotate the canvas 90° clockwise again. Apply the Tiles filter four times to the text. Duplicate the original text layer again, drag it to the top of the Layers palette and click on its Layer Visibility icon so it appears in the document. Choose an even lighter shade of your text color in the Color Picker and apply it to the text. Rotate the canvas 90° clockwise once again. Apply the Tiles filter to the text five times. Photoshop Tutorials: Choose an even lighter shade of the color and apply it to the text. Rotate the canvas 90° clockwise once again, bringing it full circle. Apply the Tiles filter to the text a total of six times. The text after deleting the white areas once again. Almost done. With the top text layer selected, click on the "Layer Styles" icon at the bottom of the Layers palette. Click on "Stroke" to select it from the list of Layer Styles. Make the changes that I've circled in red above. First, change the Color of the stroke to black by clicking on the color swatch and selecting black in the Color Picker. Lower the Size of the stroke to 1 pixel. Change the Position of the stroke to Inside, and finally, lower the Opacity down to around 20%. We just want a faint stroke, nothing heavy.